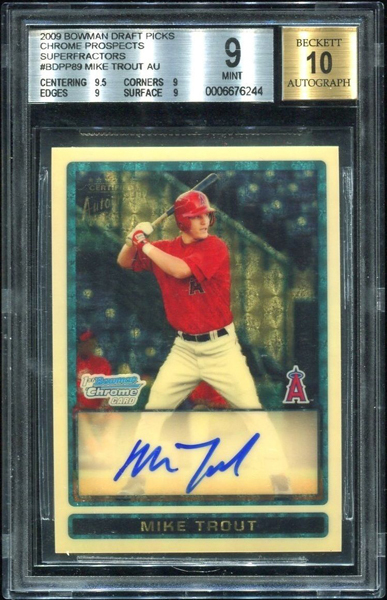 The Mike Trout 2009 Bowman Chrome Draft Prospects Superfractor has officially sold for $400,000. The card is graded BGS 9. It's a gorgeous card and one that's certainly deserving of admittance into any ultra high end collection, or any collection for that matter. Known Sports Information Consultant, Dave Oancea aka Vegas Dave, makes headlines as the buyer.2)Meet The Man Who Paid $400k for the 2009 Bowman Chrome Mike Trout Superfractor Autograph. www.beckett.com/news In addition to the Superfractor, he owns some of the other bigger ticket parallels - Red and Orange - making his the most expensive run of modern baseball cards in history. Superfractors continue to gain popularity in the baseball market. They were first introduced in 2005 but it wasn't until the Stephen Strasburg 2010 Bowman Chrome Prospects Superfractor surfaced and sold in 2010 that the Superfractor really took permanent root as the most sought after of all parallels of any card. The Mike Trout Superfractor, while didn't get nearly the same amount of hobby coverage as the Stephen Strasburg Superfractor, is one of the most significant cards in the entire hobby.